This conservation resource was created by Max Sirkin; Hector Sonnois; Nail Souilamas; Ben Warsmann. It is shared under a CC-BY 4.0 International License. The Svalbard Global Seed Vault is a secure seed bank built on the Arctic Svalbard Archipelago in Norway, the furthermost north location habitable and reachable by commercial airplanes. It was built in 1984 in a repurposed abandoned coal mine, which puts the major part of the vault deep in the side of one of the largest mountains on the island of Spitsbergen, “while the entrance might be visible, the Vault itself is over 100 meters into the mountain” . The Vault itself was imagined and designed to contain and protect over 4.5 million seed samples from (more or less) any and all possible threats: war, natural disasters, ecological disaster, extinction… The location was not chosen solely for that reason, as Svalbard is described as “a working environment and perhaps more importantly represents the nexus of a global network of economic and political interests” . The initiative came from a century-old failing movement to protect seeds of plants with a declining or endangered population. After the failure of multiple vaults around the world, this remote location was chosen to host a new type of vault. It is described as a global initiative to best all previous seed reserves through a complex network of international cooperation and funding. However this project introduces questions of technical efficiency, biology and ethics. These aspects shall be elaborated and assessed to examine the legitimacy and feasibility of such a herculean endeavor. The Svalbard Global Seed Vault was not created at random. Over the past century, the measurements of species endangerment rates became too critical to ignore: in 2016, “One in five of the world’s plant species is threatened with extinction, according to the first global assessment of flora, putting supplies of food and medicines at risk” . These realizations shook conservationists worldwide, which led them to take actions in various ways, including the creation of seed banks and seed vaults. The concept being young and underdeveloped, most of these programs were formed into local programs of seed preservation. They were government funded and government owned, like the Hawai’i Public Seed Initiative, which does not just conserve seeds, but “assists Hawaiian farmers by holding workshops to educate them about storing and improving their seed varieties”, or the New York City Plant Conservation Initiative, a program started by the City of New York in 2008: “launched with 34 endangered species, the initiative hopes to preserve New York City's biodiversity and generate awareness surrounding the conservation of urban plant varieties”. . These initiatives have a lot of worth and a lot to bring to their respective communities, but it became clearer and clearer over time that such a small scale could not tackle the biodiversity crisis that was so obviously on the way. Fear also arose as similar programs in third world countries, where some seeds were the last samples of their kind, started being threatened by problems such as shortness of funding, drought, corruption, or sometimes surrounding war and violence. Indeed, an infamous seed bank in Syria called Icarda is still going on very limited resources as war unfolds around it, presenting concerns for the conservationist community as to what would happen if it was caught in the cross-fire. It did happen, when in 2014, “the fighting drew closer to its headquarters in Aleppo and its sprawling field station in nearby Tal Hadya. Icarda’s trucks were stolen. Generators vanished. Most of the fat-tailed Awassi sheep, bred to produce more milk and require less water, were looted and eaten” . Word went around the world, raising concern as to the state of the seed preservation that was so desperately needed. The private donations perspective of this new storage system comes from the political issues regarding who could make decisions about researching crops or extracting them to use them in the replenishing of areas that suffered massive losses in biodiversity. In the past, conflicts broke out quite often since the seeds did not belong to the vaults or research centers, but did not fully belong to the government actors either. Therefore, in the effort of re-creating the vault, possession had to be straightforward and pose no problem, so that the focus of the initiative could really be oriented around security and protection “from natural or man-made disasters, so they won't be able to cause crops to go extinct” . To this day, no other seed vault contains and protect as many seed samples as the Svalbard Global Seed Vault, but it is far from perfect. Keeping it up and running it is a tenuous job, and the staff definitely have their work cut out for them. Despite being a veritable bastion, the Seed Bank has proven to not be completely isolated from the elements. In 2017, the Vault suffered heavy losses due to an unexpected leak. It is built in order to be above sea level, even at very high tide and taking into account the melting of the ice caps. However, no one expected a mass of water to come from above. Indeed, in early 2017, higher temperatures interacted with heavy rain to create a melting in the permafrost which almost flooded a part of the vault and caused the loss of an important number of seeds in one of the storage aisles. “‘A lot of water went into the start of the tunnel and then it froze to ice, so it was like a glacier when you went in,’ a Norwegian government employee told the Guardian. Fortunately, the meltwater did not reach the vault itself, the ice has been hacked out, and the precious seeds remain safe for now at the required storage temperature of -18C. But the breach has questioned the ability of the vault to survive as a lifeline for humanity if catastrophe strikes. Supposedly capable of operating without human intervention, this incident has led to the vault being placed under 24 hour supervision in order to minimize the risks . What we see here is a flaw in the vault's design. It is important to learn from previous mistakes, as researchers are doing now by waterproofing the entrance tunnel, but it is capital that these issues get resolved before it is too late. To avoid such a situation, it has been proposed that a team of experts be working as full time disaster prevention professionals. This would mean that they would constantly evaluate possible dangers and be prepared, even if the precautions are drastic. The main issue with this proposition is a lack of funding, as it would need to go up by at least 10% in order to make such measures attainable. Another issue which has been raised over the past few years is that the temperature within the vault seems to be unstable during storms and other electromagnetic events (such as auroras). When dealing with such delicate elements such as seed samples spanning from the furthest reaches of the globe, it is important to be precise about every aspect of their conservation, which means that an unplanned change in temperature, even for a few hours, could cause immense losses within the vault's seed population. Once again, an infrastructural analysis is necessary at all times in order to prevent such issues, which can arise at any time, especially as the original structure grows older. There is also a risk of accountability, as the seeds come primarily from private donations, making the blame for this type of incident difficult to place. However, the location of the vault has proven to be very beneficial. The geographic area of the vault itself serves as natural security and protection. “Getting to the vault itself is also very difficult: Spitsbergen is a very cold, very harsh island, home to a local community who look after it. “So the location itself is its own security measure,” says Haga.” . It is in an area that is not threatened by tectonic plate activity, volcanic eruptions or other natural disasters. The vault is housed inside of a mountain where the temperatures remain cold, around -4C. This means the that less energy is necessary to lower the temperature to the desired level of -16C. Furthermore, if for any reason a catastrophic event cut off the power, the vault's temperature will only rise to -4C, which will theoretically preserve them long enough to be saved. Finally, security has been continuously improved, as well as the quality of the vault. The small community nearby are assigned the task of keeping the vault safe. They have armed guards and supervise it 24/7 for any sign of damage or weakness. “Now, the Norwegian government has proposed a plan to invest 100 million Norwegian Crowns (about $12.7 million) to upgrade the Svalbard Global Seed Vault. The proposed plan includes construction of a new concrete access tunnel and a service building to protect emergency power and refrigeration units.” . This influx of funding will go directly to refortifying the concrete walls, providing increased insulation, and more storage for future seeds as well as maintaining human presence in the vault. The Svalbard Seed Vault was presented and built as an unbreachable cold chamber that can store the world's vegetation for both conservation and future purposes. There have been other seed vaults in the world, like those in Iraq and Syria, but they didn't achieve the same scale or security as Svalbard. This vault has been strategically placed to limit the potential human and natural destruction of it. It has also been placed in a climate where the seeds can still be preserved even if humans are no longer present in the vicinity. They have greatly limited the potential of destruction, but the vault is not as immortal as one might think. There was the flood that destroyed some of the sample, but it is the best vault that we have so far. Furthermore, the issues that have come up are being dealt with and as time progresses, making the risk of contamination ever so much smaller. At a quick glance, the idea of conserving organisms in a controlled environment does seem to have its benefits. In protecting and storing individuals of a certain specie, should the original population be threatened or destroyed on a small scale (i.e. a seasonal crop), then the preserved samples can be used to help recover a population . Indeed, the conservation of genetic material has been used by humans since time immemorial especially in agriculture in order to allow for a certain resilience towards environmental factors . In relation to the case study used in this page, plants have been suffering genetic erosion and hence a seedbank such as the one on Svalbard could be a potential solution to limiting the damage. In Ex Situ conservation, the organism is removed from their natural environment and preserved in an artificial environment. The major advantage of Ex Situ conservation is that in removing an organism from its natural environment, allows for it to be protected from random events that could otherwise kill large numbers of individuals . In conserving organisms like this, they can later be reintroduced in times of need . For instance, if large area of crops were affected by a pathogen, having stores of the seeds of the that same crop stored in a protected area could be used to help recover the crop. Hence, Ex Situ conservation serves as a form of insurance for biodiversity and gentic erosion, especially in the case of agriculture and plants . This application of Ex Situ conservation is especially important considering the large amount of uses that plants have in society other than nutrition (medicine, fuel, construction materials etc…), thus it also allows for many basic needs of life to be protected and available in case of an emergency . A further case for Ex Situ conservation, especially in the case of seed banks such as the one at Svalbard, is that in creating a diverse collection seeds in one location it facilitates research as the whole collection is available to study in one location . However, in the case of the Svalbard seed bank, this is unfortunately not the case as due to the laws on the storage of seeds and organic material, only the owners of the seeds are allowed access to them  Moreover, a seed bank is an efficient way to store samples and genetic diversity, as the Svalbard seed bank has 890,886 samples preserved in a secluded and protected location  Finally, Ex Situ conservation in the form of a seed bank is also a feasible form of mid to long term genetic material storage, especially in the case of the Svalbard seed bank which, due partly to its location within the arctic circle, benefits from the cold climate to maintain a constant temperature of roughly -18°c which is needed to successfully store the seeds . Despite the obvious use of seed banks as an effective form of Ex Situ conservation, there are many problems and limitations that are associated with the process . The first and most compelling problem is that in isolating organisms from the environment, they are no longer exposed to the pressures of natural selection and the general environmental conditions that the seeds would be exposed to in the wild . Thus, in removing the effect of natural selection, the seeds may not be well adapted to survive if they are reintroduced into the nature as they might lack the traits that have been “selected” by natural selection . The same argument can be made for the rest of the vectors of evolution (mutation, gene flow, genetic drift etc…). Thus, the purpose of the seed bank would be completely defeated as the preserved seeds could be useless in the future. A further limitations of seed banks is that in storing seeds only a fragment of an ecosystem is being preserved, which itself is connected and integrated to its surrounded ecosystem in multiple complex ways . Hence, if seeds that have been preserved over a long period and then be introduced into ecosystem that has changed, it is likely that the seed will not be able to develop properly or even survive. As the two arguments have shown, seed banks are not necessarily a form of insurance against large losses of crops or other biodiversity, as Ex Situ conservation isolates the specimens from natural forces (natural selection, ecological succession etc..) which are essential in shaping its place and role in ecosystem as it evolves . This limitation can severely limit the use of a seed bank, as the preserved specimens may not be relevant or adapted to the ecosystem in which they are reintroduced. There is however a solution to this biological lag, If the samples of seeds that are stored are replaced regularly, in order to reflect changes in the original population, then the conservation would be accurate . However, regularly updating the inventory and making sure that the samples conserved are biologically and ecologically relevant are time consuming and expensive resources. Notably in the case of the Svalbard Seed Vault, which stores samples from all round the world. Moreover, the process of storing the seeds is an expensive one, as they need to be kept in very specific conditions that requires a constant source of reliable energy, which makes the process only available to developed nations . Furthermore, it has also been shown that even when stored properly, the genetic resources can be degraded . Additionally, seed banks are only known to work for plants from temperate regions, which limits the scope of their use . Finally, the collection will only be as good as the samples taken from the original population . Due to obvious limitations a complete cross section of a population’s genome is impossible, hence the seed bank can only represent a fraction of the natural populations genetic variation . This is especially true if the sampling undertaken is random . Although, this problem can be bypassed by selecting certain phenotypes to be preserved, yet it remains somewhat limited as the environmental conditions in which it might have to reintroduced can not be know for sure . From a scientific and biological perspective, the practice of Ex Situ conservation can be effective in the short term and with clear objectives . However, it is not a guaranteed insurance against the loss of biodiversity and society should not be lulled into a false sense of security which is often given by popular perception of Ex Situ conservation and seed banks. The Svalbard Global Seed vault serves as a benchmark for seed conservation worldwide, being the largest of its kind, making it the first remarkable attempt of this scale of a seed bank worldwide . However, with a project of this scale being attempted there are a number of ethical concerns to be addressed, as this type of endeavor obviously raises some concerns both from economical and biological perspectives. In this analysis, these various concerns shall be addressed in an attempt to elucidate the moral framework from which this scale of project draws its legitimacy. Amongst these concerns lie issues of commercialization of seeds by large corporations, social difficulties in achieving a project of this scale, and most importantly, the feasibility of a conservation model which requires interrupting the cycle of evolution. The first of these concerns is the issue of commercialization of seeds by large corporations. 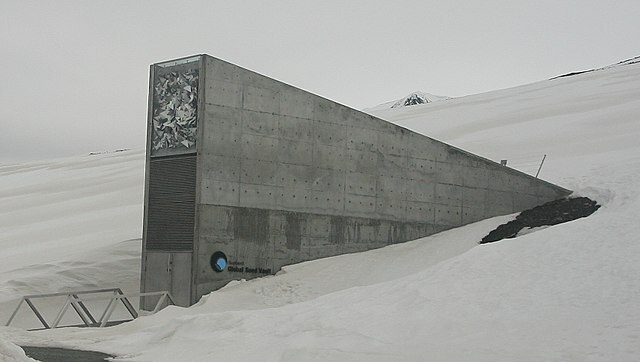 Upon the Seed vault’s opening in 2008, it was referred to by many as the ‘Noah’s Arc’ of biodiversity protection for generations to come Cite error: Invalid <ref> tag; name cannot be a simple integer. Use a descriptive title. However, critics concerns of the risk of exploitation of small seed banks deposits in the vault by large and powerful companies raise issues of a paradigm shift. Indeed, small seed banks are being encouraged more and more to deposit their samples into Svalbard. What they are not being told is that, according the executive director of food safety Andrew Kimbrell, these smaller seedbanks are inadvertently being subjected to “an international treaty on plant genetics that exposes their seeds to commercialization”Cite error: Invalid <ref> tag; name cannot be a simple integer. Use a descriptive title Essentially, Kimbrell warns that by placing all of these seed samples in one place, it turns a complex worldwide network of crop diversity and variety into a giant store where large corporations will be able to come and poach whatever samples they need, enabling them to commercialize and produce them unhindered by the previous complexities when they were spread across the globe. Although it is true that these coorporations are unable to patent the seeds themselves, they are capable of exploiting and patenting their genes, putting them in a position of legal power by piling the small seedbanks with paperwork that they are unable to go through without an extensive team of lawyers to sort through them. This puts these smaller actors in the world’s seed economy at risk, without incriminating the larger corporations at the helm of such operationsCite error: Invalid <ref> tag; name cannot be a simple integer. Use a descriptive title. Despite these allegations being refuted by the executive director of the Global Crop Diversity Trust, Cary Fowler, Kimbrell’s concerns raise important questions on the fairness of such a large amount of seeds being gathered in one single location. Additionally, questions on the difficulty of realistically achieving a Global Seed Vault in our complex global framework are raised. The Idea of Svalbard first took its model from the onslaught of regional seed banks that developed over the course of the 1970’s, whose goals were more oriented towards the preservation of the genetic inheritance of a specific region . Once put into practice, it was quickly found that a series of issues arose with these types of regional storage methods. Problems involving power outages, lack of funding, flooding, fires as well as a series of these vaults being located in regions of political conflict such as war-torn Syria have jeopardized the safety of the seed samples . For these reason, the Svalbard seed vault could come as a solution to some of these hindrances, serving as a centralized and secure location. The legitimacy of these claims, albeit their appeal, are far from confirmed in practice as we describe previously. Furthermore, there are important questions to be raised as to the moral justifiability of interrupting the cycle of evolution by withdrawing a seed from its biological cycles. Seed banks cannot be the only answer to saving crop biodiversity, as many varieties of crop that do not produce seeds are rarely stored in these banks, such as cassava, bananas as well as many varieties of fruits and berries . Also, local knowledge of these deposits that are often even more essential than the samples themselves are very rarely recorded. When withdrawn from their natural habitats, they are unable to adapt to changes in their natural climate that are unpredictable. For example, throughout the last 15 years in West Africa, certain populations of traditional sorghum varieties have been subjected to a shortening of their growth cycle by a full two weeks in response to a reduced rainy season . By extracting these seeds from their natural habitats, there is a possibility that they will no longer be able to be reinserted into the ecosystem when they are needed most, which obviously creates a moral quandary. It places our species in a position of power as we would essentially be hindering the natural progression of evolution. The Svalbard Global Seed Vault may indeed be the solution to the extinction of various varieties of agricultural goods amidst a changing climate and continuously evolving agricultural practices. As has been observed throughout this discussion, the vault is endowed with state of the art security and climate control, theoretically capable of withstanding the test of time with or without human intervention. However, issues with the vault's construction have been shown to lead to deficiencies such as flooding and unexplainable temperature fluctuations. Having seeds as a form of backup in the event of a virus or mass extinction of our agricultural products as we know them provides a sense of security to mankind. On top of this, the vault's sheer size proves efficient as well as convenient. Despite that, by gathering all of these samples in one place, it permits a facility in accessibility that could jeopardize smaller actors by the commercialization of certain seeds by large agricultural firms, simply due to legal grey areas and the power such firms have obtained. Also, social issues are being raised as to the feasibility of such a project and its introduction into our complex global economy amongst concerns of various hazards to the samples themselves. Beyond all of this, there are undeniable shortcomings to a system where mankind is capable of interrupting the cycle of evolution, both from a biological as well as an ethical perspective. ↑ Carrington, Damian. (2017) Arctic Stronghold of World's Seeds Flooded after Permafrost Melts. The Guardian, Guardian News and Media, 08/04/18, www.theguardian.com/environment/2017/may/19/arctic-stronghold-of-worlds-seeds-flooded-after-permafrost-melts. ↑ Griffin, Andrew. (2018) Seed Vaults Protect the World from the Apocalypse – but What If Doomsday Is Already Here? The Independent, Independent Digital News and Media. www.independent.co.uk/life-style/gadgets-and-tech/features/seed-vault-doomsday-svalbard-norway-milennium-kew-biodiversity-bank-gene-a8237221.html. ↑ Furness, Dyllan. (2018) “Doomsday Seed Vault to Get $13 Million Upgrade in Face of Climate Change.” Digital Trends, Digital Trends. Retrieved 02/04/18. 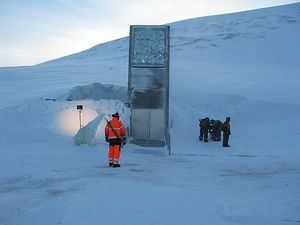 www.digitaltrends.com/cool-tech/doomsday-vault-upgrade-climate-change/.